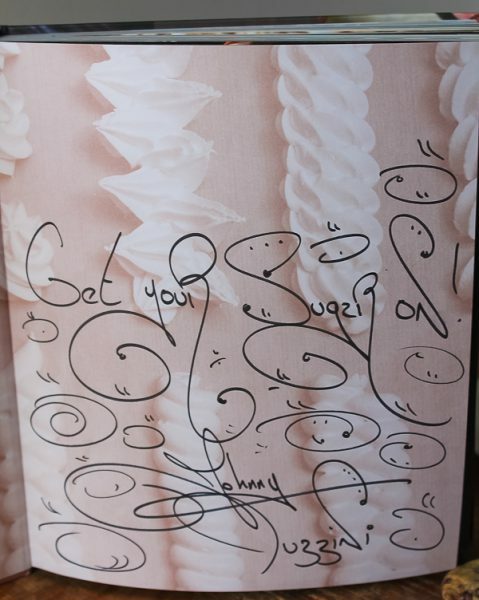 Those of you who love to bake probably know James Beard Award-Winning Pastry Chef, Johnny Iuzzini. You may also know him as the head judge of past show Just Desserts on Bravo’s Top Chef, and one of the current judges on the hit program The Great American Baking Show on ABC. 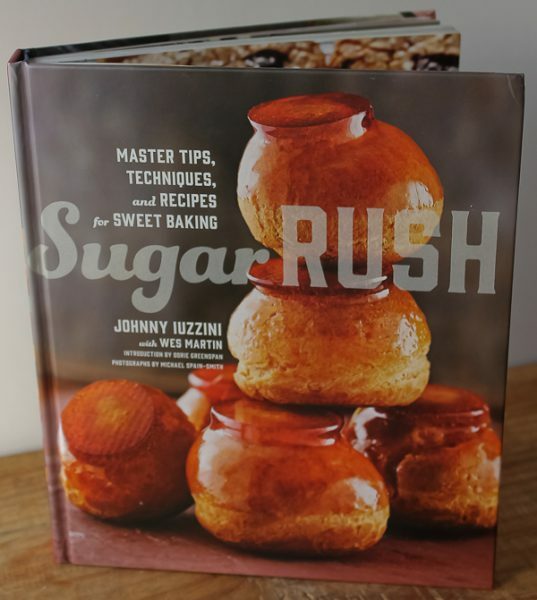 All of these achievements and more made Sugar Rush the perfect cookbook to begin January, which also happens to be National Baking Month. This incredible cookbook is for the home cook and pastry chef alike. It’s easy to read and follow, with basic recipes yet such creativity too. You will love it if you have a passion for baking. In the Custards and Creamy Desserts chapter, you will learn how to make a classic vanilla cream sauce (Creme Anglaise) but also how to make a roasted white chocolate panna cotta. 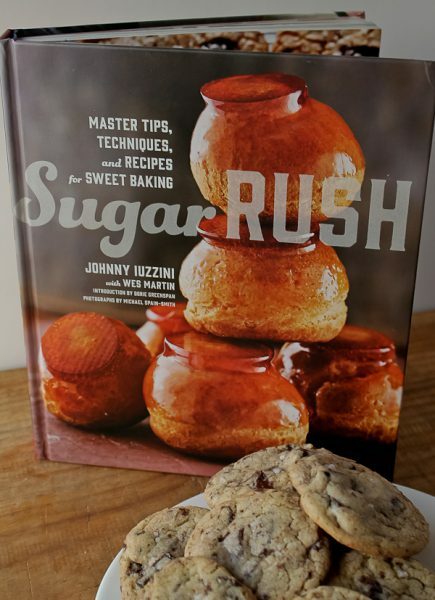 The other chapters include Eggs and Meringue; Caramel; Cakes, Cupcakes, Brownies, and Muffins; Cookies, Tea Cakes, and Biscuits; Tarts, Cobblers, and Crisps; Yeast Doughs; Glazes, Frostings, Fillings, and Sauces; and how to build a balanced dessert. I decided to start with the very basic and popular chocolate chip cookie. Except, and not surprisingly, it was not just any chocolate chip cookie in this cookbook. 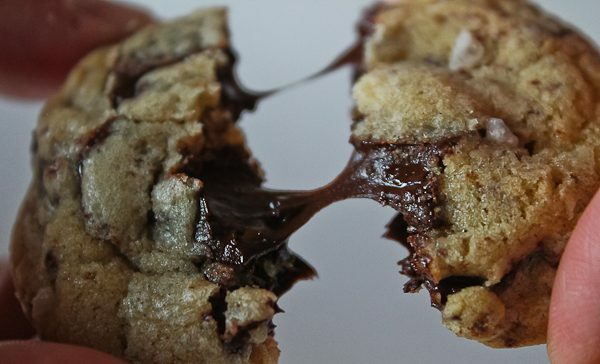 The exact name is Killer Chocolate Chip Cookies, that contain a touch of cinnamon, almond extract, and a sprinkle of smoked Maldon sea salt on top. Oh, yes, they were killer all right, even the dough. Use all your willpower not to eat most of the dough so you can enjoy the cookies. The cookies are beautiful with a fine crumb (there is some cake flour in the dough) with crispy edges yet a gentle softness in the center. Great with a glass of milk. Oh, yeah…. would you like one? Or two? Get this book now. But first make the chocolate chip cookies. You will want to make everything after that. Preheat oven to 350 degrees. Line 2 baking sheets with silicone mats or parchment paper. Put the butter, granulated sugar, and brown sugar into a standing mixer bowl and toss with your fingers until the butter is coated. Attach the bowl and paddle to the mixer and beat the butter and sugar on medium-low speed until a thick paste forms with no visible butter lumps. Add the vanilla and almond extracts and mix well. With the motor on low speed, add the egg and egg yolks, one at a time, mixing well between additions. Stop the mixer and scrape down the bowl with a rubber spatula. Meanwhile, in a separate bowl, sift together the flours, baking powder, baking soda, and cinnamon; sprinkle the kosher salt over the top. With the mixer on low speed, slowly add the dry ingredients to the butter mixture, stopping frequently to scrape down the bowl. Mix until just combined; remove the bowl from the mixer and fold the chocolate into the dough by hand. Using a small (1/2-ounce) ice cream scoop, scoop level balls of dough and arrange them about 2 inches apart on the lined cookie sheets. Use the bottom of a glass to flatten the dough balls slightly and then sprinkle a little Maldon salt over each cookie. Bake for 12-13 minutes, rotating the pans once, until just set and the bottoms are beginning to brown. Cool for 10 minutes on the pans before transferring to a rack to cool completely. Store the cookies in an airtight container for up to 3 days, if they last that long! I think you can get smoked Maldon salt at Sunset Foods–I know I’ve gotten regular Maldon there. This recipe sounds great–have to try it. Thanks, Barb. I’ll look there. I immediately went out today and bought the ingredients I didn’t have for the Killer Chocolate Chip Cookies. Great choice to share from his book. Can’t wait to try them out on my family. I will let you know what they think. Can’t wait to hear, Kim! Thanks for sharing ! I will look up this cookbook, it sounds great. I love Leena’s slice cookies an have made them several times…! JoAnn, did you order the dark syrup online for the cookies? I’m thrilled that you made them!